You'll need to get to Fort William's train station early. I was staying at Fort William Backpackers so it was a fairly short walk down to the station from there. You need to catch the first train south from Fort William. It's running from Mallaig, where the ferry to the Isle of Skye connects, and it will continue south across the moors to Glasgow's Queen Station. This is the West Highland Line (or the Rathad Iarainn nan Eilean in Scottish Gaelic). It is frequently voted the most scenic or best rail journey in the world. First ScotRail operates the trains. There are four trains south on most days, just three on some Sundays. 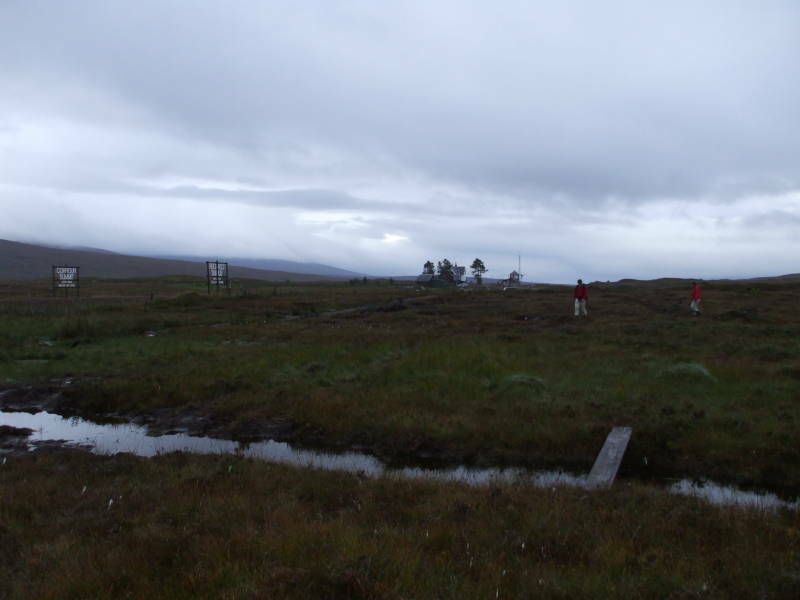 You need to get to Corrour by about 0830 so you have enough time to finish the route. Therefore you need to be on the first train south in the morning. 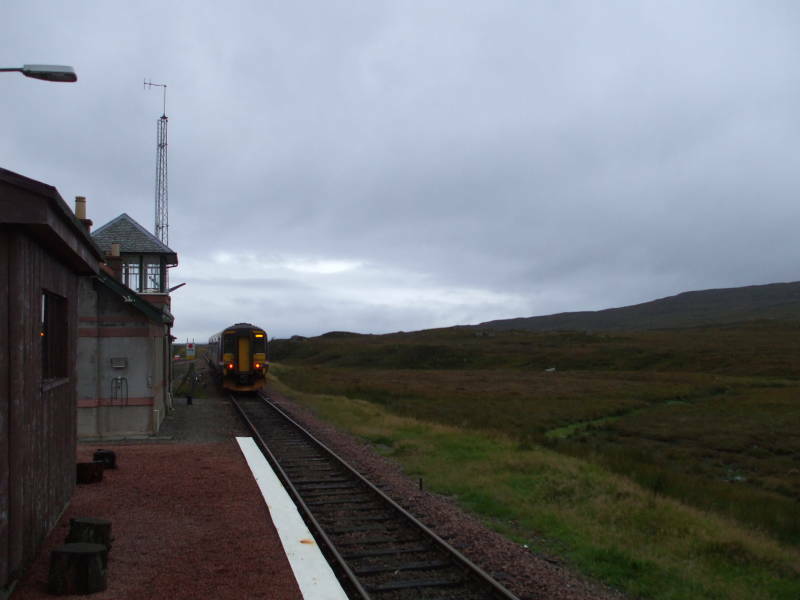 Corrour station is at the summit of the rail line, at 410 meters (or 1347 feet) above sea level. It's the highest mainline railway station in the U.K. There are no roads leading to the station, the nearest road is ten miles away. Despite the tiny size, lack of surrounding infrastructure, and isolated location, there is daily direct service to and from London Euston station on the Caledonian Sleeper overnight train. The train continues south toward Glasgow's Queen Station. 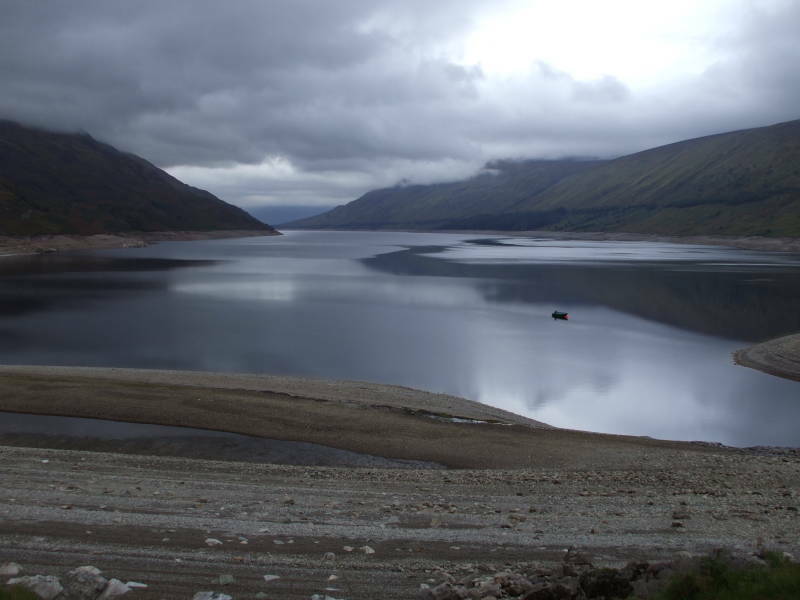 Not only is there not very much at Corrour, even what little is there is unavailable to hikers geting off the train. Yes, there is a hostel or B&B or similar operation in the station. But its facilities are not available to people who aren't staying there. I told you to fully prepare before starting the trek. 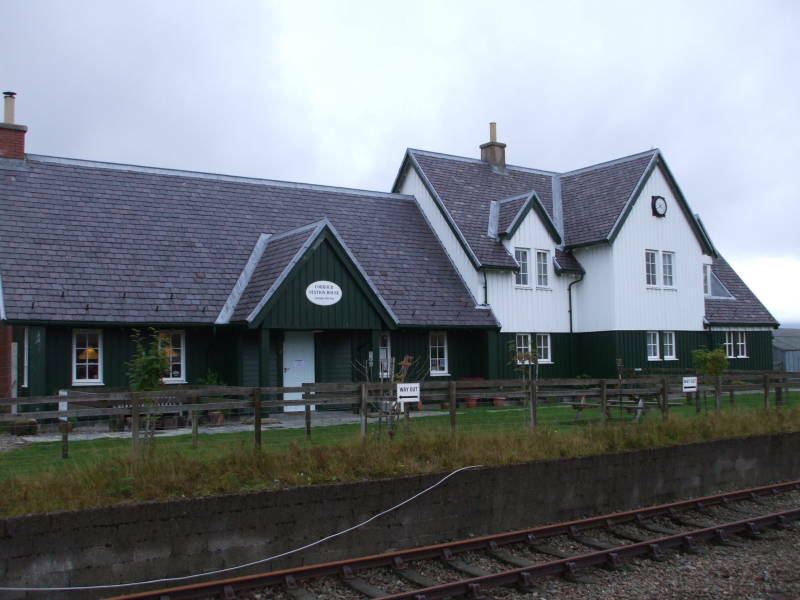 Corrour Station is around NN 355 663. Cross the tracks and turn to your right, to the north. 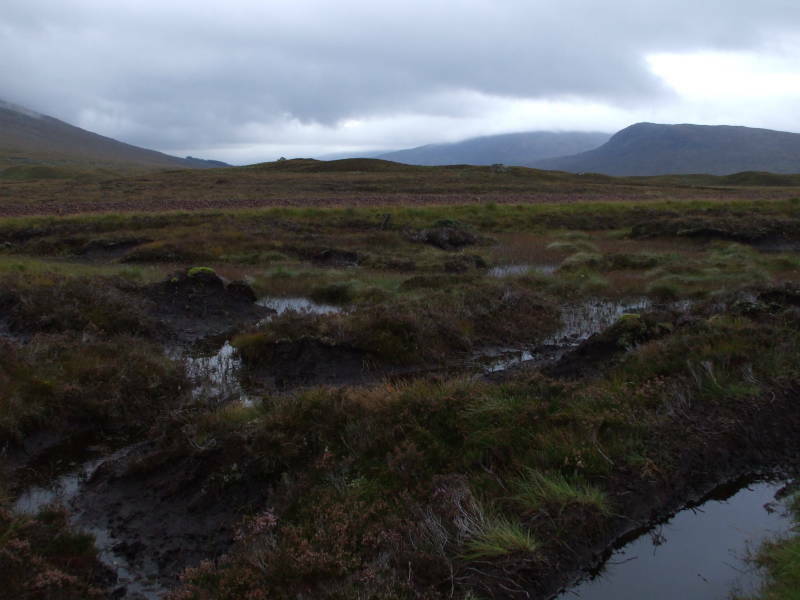 Try to avoid sinking past your knees in the boggy peat. Welcome to Rannoch Moor. A sign there claims that it's just 20 miles (32 km) to Fort William. In some idealized sense, yes. But I would add another two to three miles to account for the practicalities of route-finding in the middle of the walk. At least as helpfully, it also indicates that Fort William is known as An Gearasdan in Scots Gaelic. Within two to three hundred meters you pass a pair of signs along the rail line marking Corrour Summit. There are some railroad cross ties along the first part of the path. In places they are actually floating in the boggy peat. That very quickly tricks you into stumbling into very deep muck. Rannoch Moor, with Corrour Station in the distance and Corrour Summit at left. Boggy Rannoch Moor on the way from Corrour Station to Loch Trèig. The West Highland Line was built across Rannoch Moor on a sort of mattress of tree roots, brush, and earth and ashes. Really. The rail line is still floating on top of the bog. I suspect that the extra-boggy and unmaintained nature of this first part of the path is intended to scare off those who should not be casually wandering into the Highlands. 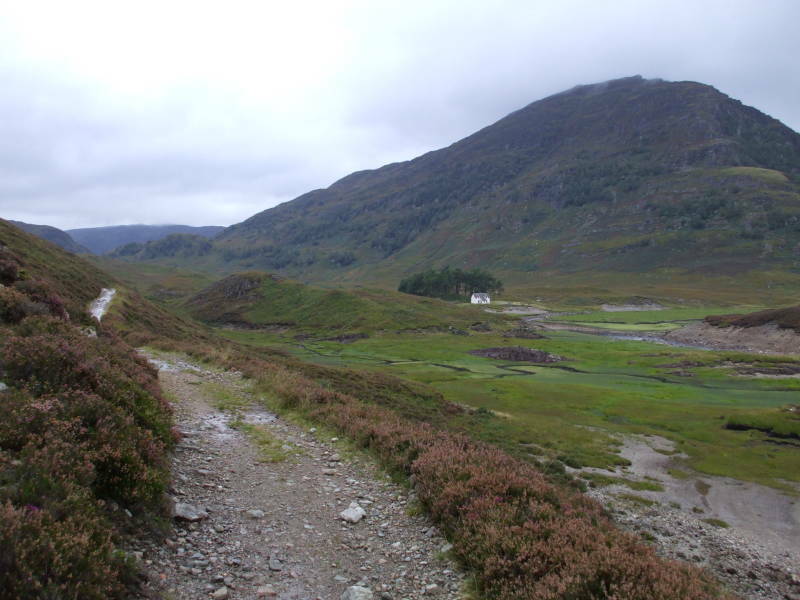 After the initial penance of a kilometer or two of very boggy ground near the station, the path joins the rough track that connects Corrour Station to Creaguaineach Lodge. Enjoy this easy walking. It will be the last for about seven hours. 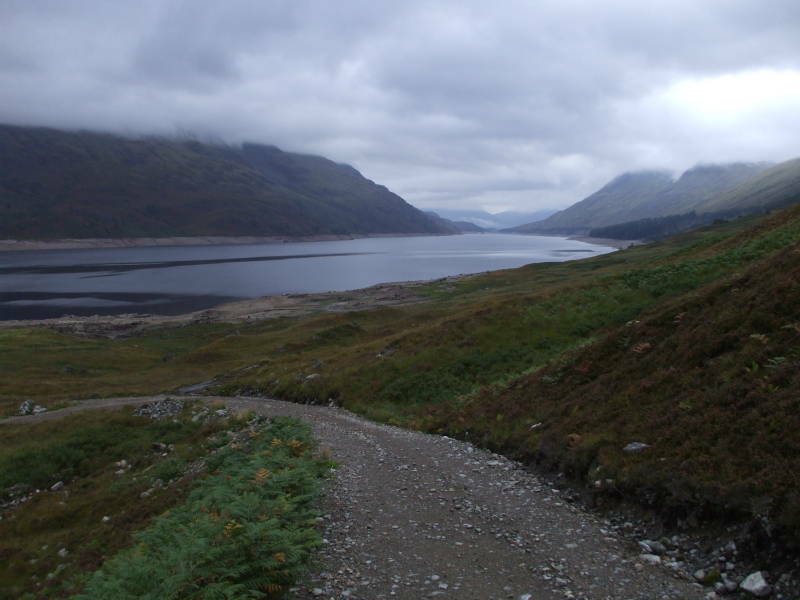 A luxurious track down to Loch Trèig. Looking north, up the length of Loch Trèig. The West Highland Way rail line is visible above the shore at right. The path and track lead down around the south end of Loch Trèig. Not to be too grim, but loch trèig is Gaelic for lake of death. It's a fairly large loch, nine kilometers long. It looks mostly natural today, but a dam was built at its northern end in 1929 to form part of the Lochaber hydro-electric system. The water level was slightly lower when I was there, leading to the bare shoreline seen above and here. There used to be two small communities along the shore of this end of Loch Trèig, Kinlochtrèig and Creaguaineach. They had been the sites of locally important markets, especially for the cattle drove routes back when The Road to the Isles was used to move cattle. Somewhat surprisingly, you come round the bulk of Garbh Chnapan to see the large Creaguaineach Lodge where Abhainn Rath empties into the corner of the loch. Creaguaineach Lodge, in front of Creag Ghuanach. Continue toward the lodge where a small bridge crosses a stream flowing into Loch Trèig. You will turn southwest along that stream, Abhainn Rath, at NN 309 688.